Habitat : It grows in the hilly regions in the northwestern himalayas. Uses : The rhizome is sweet, bitter and acrid in taste with a neutral potency and act as antiseptic, anti-bacterial, anti-fungal, anti-inflammatory, analgesic and mild diuretic. 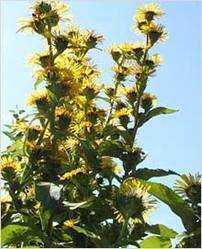 It is used in the treatment of contagious fevers, anginapectoris, heart disease and ischemic heart disease. It is also used in cough, hiccup, bronchial asthma, indigestion, flatulence, inanorexia and in fever. Externally, the paste of its roots is used effectively, in dressing the wounds and ulcers as the herb possesses antiseptic property. Also used to boost the appetite.